Click photo to see QuickTime movie (7MB), courtesy of the Simon Wiesenthal Center. Click cover to purchase Mr. Dyby's book. If only there had been more like him . 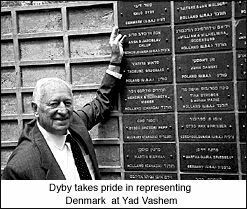 . .
On November 9, 1999, Knud Dyby was honored again by the Los Angeles Simon Wiesenthal Center for his humanitarian efforts during WW II. He was there as a representative of a small nation that showed the world it is possible for ordinary people to stand firm against the forces of evil. 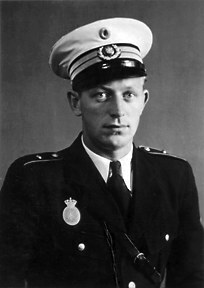 For his efforts, he has been recognized by numerous Jewish organizations for his courage in helping Danish Jews escape from the Germans to neutral Sweden. 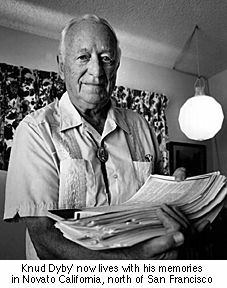 Dyby is in his eighties now, and lives in a modest aluminum-sided home tucked away in the hills north of San Francisco. There are large paintings of sailors in small boats on every living room wall, the same paintings which once adorned the walls of his parent's home in Denmark. There are other memories of times past in these rooms. Photographs, commendations, ribbons, pieces of uniforms, all mementos of Dyby's World War II experiences. And tucked into a small display case is a medal from Yad Vashem, Israel's Holocaust Memorial. The State of Israel has awarded Knud Dyby the title "Righteous Among the Nations" for his courage, bravery and humanitarian actions. Dyby is a modest man. Although he has been honored many times for his activities in the Danish underground during World War II, he insists that he only played a small role in his country's resistance efforts. Although he talks about himself with great reluctance, he speaks with enthusiasm and pride about the actions of his countryman in the face of Nazi oppression. He is particularly proud of the way ordinary Danes behaved when German soldiers came searching for Denmark's Jews. The German army occupied Denmark in 1940, but for various strategic reasons allowed the Danish government to continue running the country. This uneasy agreement continued for three years, until German demands became totally intolerable. In the face of mounting tension, the Danish government was replaced in August of 1943 with one the Germans hoped would be more manageable. 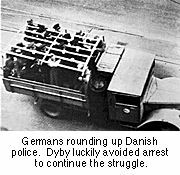 But pressure on the German occupation continued to increase within Denmark as sabotage and other forms of resistance to the Nazis escalated. The Germans, frustrated in their inability to intimidate Danish resistance, declared marshal law. There were a series of crackdowns as the Gestapo tightened its noose around little Denmark. Then, in September, startling news spread through the country. A German diplomat, Georg Ferdinand Duckwitz, informed the Danes that Hitler had decided to round up and deport the country's Jews. The "Final Solution" was coming to Denmark. Dyby was 26 at the time and a policeman. He came to this position through his experience as a Guardsman at the Royal Palace in Copenhagen. He was drafted into the military when he was 20, and assigned to the Guard because of his good looks and tall military bearing. Today he jokes that 1937 "must have been a bad year for good looks." But his training and experience as a Royal Guardsman turned out to be anything but frivolous. He would soon find ways to put this early training to unexpected uses. As a police officer and avid sailor, he had access to information vital to the underground. He knew the best hiding places near the fishing coves. And he knew the patrol routines of the German navy along the best sea lanes between Denmark and Sweden. This information was critical in planning the hundreds of dangerous crossings that took place under his direction. When the news spread of Germany's intention to round up Denmark's Jews, the county quickly mobilized. The evacuation began in dark and rainy October. 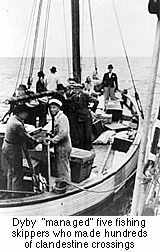 Within three months (some accounts say two to three weeks) individual citizens and small groups were able to smuggle nearly all of the 8,000 Jews living in Denmark across the narrow body of water between Denmark and Sweden. A number of underground organizations in both Denmark and Sweden worked together against the Germans. Ordinary Danish citizens played a major role in these efforts and sheltered Jews from the Gestapo in every conceivable nook and cranny. Hospitals were favorite hiding places, harboring approximately 1000 Jews. As grim as the situation was, there were moments of humor. Dyby likes to tell the story of the nurse who asked the doctor what to put on the chart of a particular Jew she found under the sheets on her ward. "German Measles," said the doctor. Dyby was a member of the Danish-Swedish Refugee Service, a group responsible for transporting 1,888 people to safety. Not all of these people were Jews; there were Allied airman, saboteurs, Baltic refugees and others fleeing the Nazis. 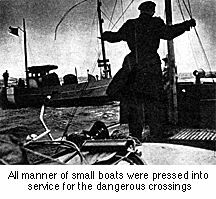 From 1944 until May 4, 1945, Dyby "managed" five fishing skippers. They crossed the sound between Denmark and Sweden hundreds of times with mail, money, weapons. Intelligence information, news and refugees. His last efforts were for a large group of Estonians. There are many other examples of citizens in occupied countries helping Jews. Many non-Jews risked their lives in the process, and many died for their acts of conscience. All of these efforts should be honored. But what happened in Denmark was different. Denmark was the only occupied country that went out of its way to protect its Jewish citizens. 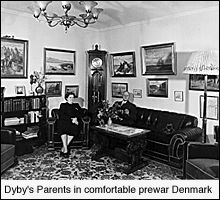 Unlike other Eurpean Jews who found that their homes had been taken away, their property destroyed, when Denmark's Jews returned after the war they found that their homes and property had been protected by their non-Jewish neighbors. While the vast majority of people in other countries stood silent, Danes acted. When asked about the extraordinary efforts of his countryman, Knud Dyby is hard pressed for words. The heroic efforts of his people seem to him to have been the only natural response. Danes, he says, have always been loyal to their friends and neighbors, and that is exactly what the Jews of Denmark were. They were not considered different or outsiders. They were a natural part of the Danish nation, just people who happened to practice a different religion. The cultures and situations in each country occupied by Germany during the war were different. But still . . . . The Danish experience makes it possible to believe that people in other lands could have more effectively resisted the brutalization and extermination of millions of Jews and other innocents. If only there had been the will. 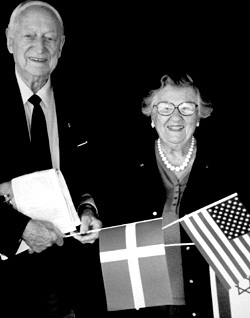 In June, 2000 Knud Dyby traveled with author Martha Loefler to Denmark, where she experienced for the first time the country and people she descibes so well in "Boats in the Night." 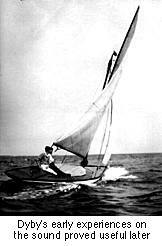 You can read more about Knud Dyby's participation in the Danish resistance and his efforts to assist Jews in escaping to Sweden in the book, Boats in the Night. Journalist Martha Loeffler provides a dramatic narrative of Dyby's experiences and a historical overview of Denmark during the German occupation.